The Art of Life Tarot, created by Charlene Livingstone and published by US Games Inc. was lovingly created in a time where she found herself searching for comfort after her husband was diagnosed with Alzheimer’s disease and felt helpless as many families find themselves after such a devastating diagnosis of a loved one. 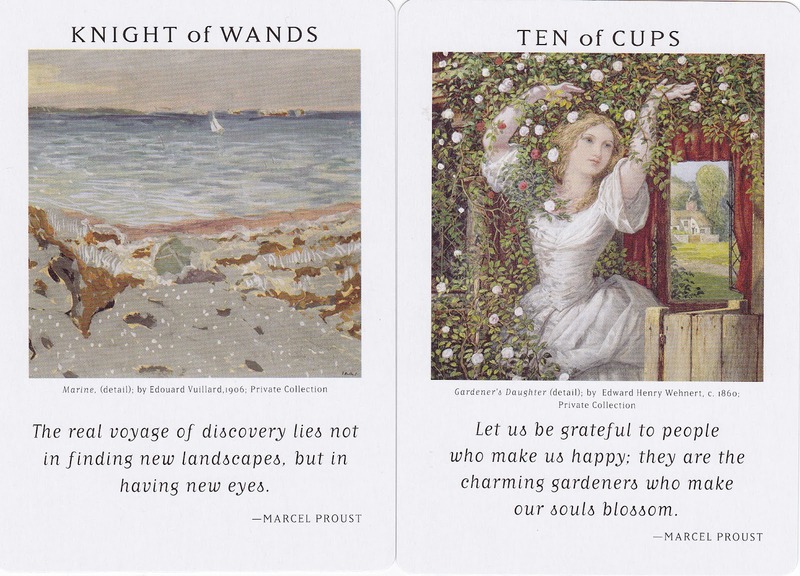 Using her background in art history and love of quotes, she has designed a beautiful deck that not only inspires, it causes one to reflect deeply upon the meanings and how they apply to the reader. Wanting to create something to empower and work interactively with the reader, Charlene has created a wonderful deck that somehow sets itself apart from most other decks and one of my favorite parts of this individuality is the very box itself that contains the cards. The box is made of durable cardboard and has an amazingly simple feature that I absolutely love…it flips up and then back down with a slit at the top that you can slip your card of the day in and sets right on your desk displaying the selected card for contemplation…how cool is that?! The deck itself is 78 card deck that follows the Rider Waite imagery and has wide beautiful borders on which the card name is printed at the top with an image painted by a well known artist, followed by information about the painting just below it and a quote to read and meditate about during your day below that. 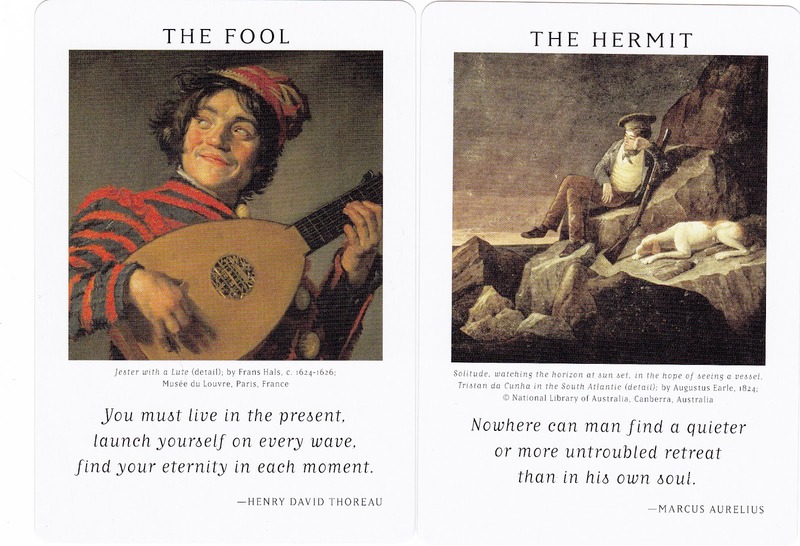 Traditional artworks have been used in other decks such as The Golden Tarot and Touchstone Tarot by Kat Black but this deck is set apart with it’s wonderful imagery and thought provoking sayings such as on The Fool…“You must live in the present, launch yourself on every wave, find your eternity in each moment”– Henry David Thoreau… what a beautiful way to capture the essence of The Fool, don’t you think? This deck comes with the standard LWB (little white book) but instead of a whole list of different keywords, it contains just a few for each card as to make it easier to develop your own meanings and interpretations that will resonate with you so much better. 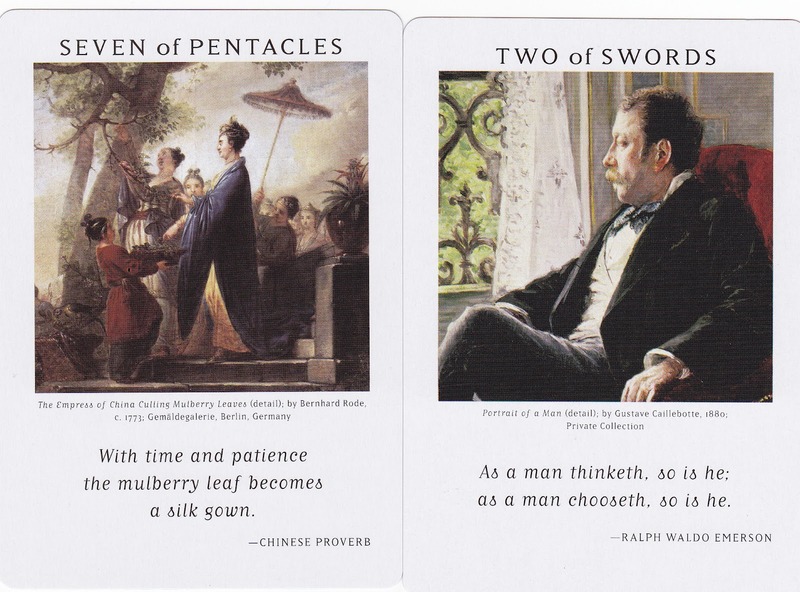 The cards are a bit larger in size, (3 1/2″ x 5″) which may be a bother for readers with smaller hands but as with my “go to deck”, which is quite large, I simply side shuffle and have found that it works quite efficiently. I love the lamination, not too glossy as to reflect any ambient light but just glossy enough to show off the wonderful images. 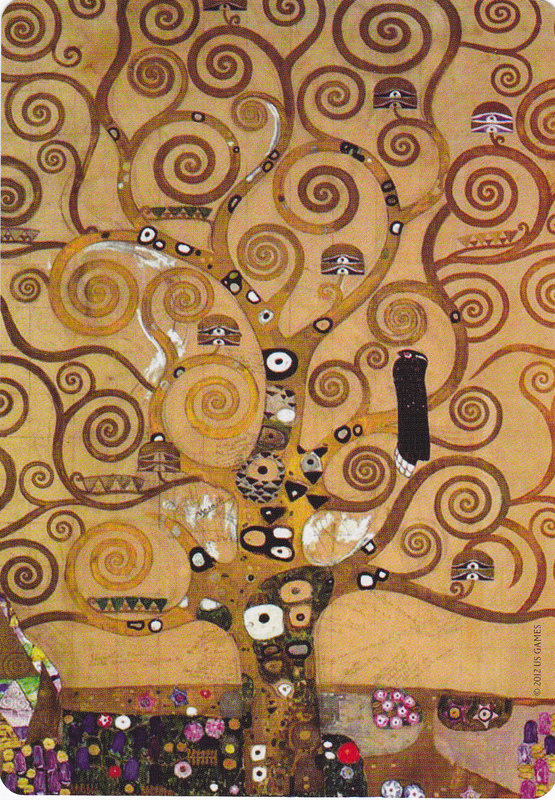 The back of the cards are quite attractive and one of the features I personally look for when selecting a prospective deck, with a gorgeous depiction of the Tree of Life. 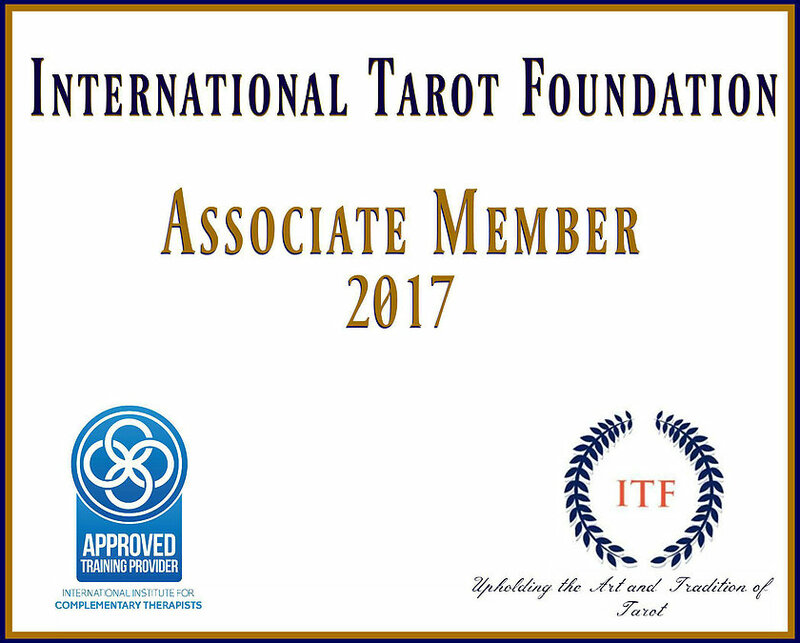 This is truly a spectacular deck that can be read with by all types of readers and is perfect for reflection and personal use as well. I thoroughly enjoyed working with this deck and I had to write this “sneak peek” review because it was just so amazing! The deck is not yet listed on US Games’ website but will appear within the next week or so, I hope you will hop on over and check out all the wonderful decks that they have to choose from! I just finished reading Bonnie’s review of it, too; what a wonderful deck!!! A lovely and healing deck. This would be an inspiring deck to use for your daily personal meditation or a general reading. I love the art and the quotes she selected. Even if you don’t have a question, the art and quotes touch on something we might not be aware of on the surface but reveals itself. A beautiful review Liz!